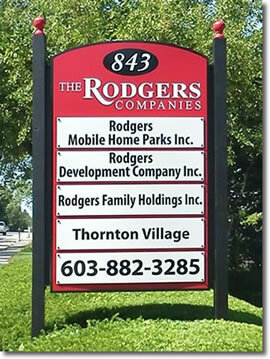 Central New Hampshire’s premier affordable housing specialist – Rodgers Development Company - provides several options for housing with convenient access to all that this fantastic area offers. Located just west of I-93 at the Exit 20 interchange, our manufactured housing communities and duplex townhouses present unsurpassed value in this region. Serving the active, 55 and older senior housing market, Rodgers Family Holdings, Inc. offers two communities to Massachusetts residents looking for affordable, quality living. With the ease of one floor dwellings and a minimal of upkeep requirements, these communities may be just what you or your loved ones are looking for. Convenient to Nashua’s Amherst Street/Rt. 101A corridor, and the Everett Turnpike at Exit 8, Thornton Village offers a quality, family park setting on the northwest side of town. While close to shopping, dining and services, Thornton Village is a truly residential community.